What components are a part of an effective, impactful marketing video? 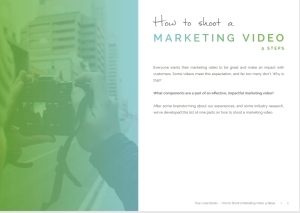 After some brainstorming about our experiences, and some industry research, we’ve developed this in-depth list of nine parts on how to shoot a marketing video. Enter your email below to download the PDF now! Also, you’ll get access to our Video Resource Center where we provide regular updates on new tech, tools, and tips to make better business videos. Look for a confirmation email with more details!